I came here straight from college. I had just completed all my a-levels and was looking for something within the radio sector of the music industry. This was because I had been doing voluntary radio at college, which was incredible. I was a Broadcast Assistant at a community station for a year and then became presenter every Saturday. It was one of the best things I’ve ever done, I was really happy there. I applied for this role through DiVA, you help young people find apprenticeships. I saw on your website that Warner was looking for an apprentice, so I applied through via the website. 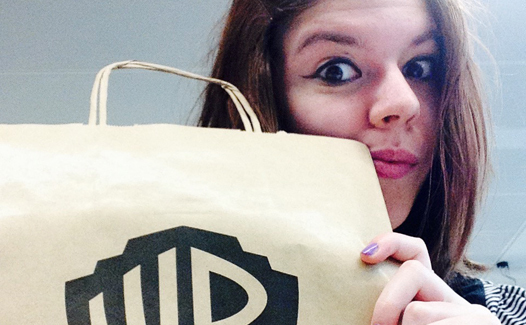 Can you tell us a little bit about your role here at Warner Music? I am a Radio Promotions Apprentice, so I assist the radio team who do regional and national radio. We get all the playlists from the big stations, like Radio One and Radio 2 as well as Global and Bauer stations, such as a Capital and Absolute Radio. It’s my role to then analyse them and monitor how well Warner’s artists are doing. That’s my main role – I also analyse Shazzam and ITunes, again to see how well our artist are doing. The radio promotions team is quite small; there are four of us and our manager. So it’s only a very little team, but it’s really nice. We have one member of our team that works specifically for national radio and another member that works specifically for regional radio. It’s really interesting to see where their similarities and differences are and how they cater and promote differently. So the marketing’s kind of different depending on whether it’s regional or national. I’m so passionate about music and coming here everybody else shares that same love. What would you say your favourite aspect is about the role? Making the press packs are quite fun! You have to write down who the artists are, the album name and a bit of information about them, then stick it on a CD and send it out to radios. For Duran Duran’s new album, I was kind of given the reins to make a little press release for them. So I would write down anything interesting about the album to promote it, like that Mark Ronson has produced it. It was nice that the team trusted me to build up that press release and get it sent out to radio. What would you say the best thing is about working for Warner Music? I think because radio is my first love, I had such a good time doing community radio. I’m so passionate about music and coming here everybody else shares that same love. Everybody here is so lovely and it’s just a joy to work with people managing bands that I love. Some of the bands on our roster are bands I’ve been listening to for years, which is really cool. Being able to work alongside these playlists we get sent in is so interesting and exactly what I want to be doing. What advice would you give somebody who might be looking to work in radio promotions? The best advice I can give is that you have to get out there and do something – check DiVA!, because it’s not going to happen if you wait for it. I did a really stupid thing at college and didn’t take media studies because I was told it wouldn’t get me where I wanted to go. When I started college I realised that I wasn’t doing anything with radio, and radio was what I wanted to do. So I thought ‘what can I do about that?’ and the answer was to join a community radio station and start looking for apprenticeships after. If didn’t do this then I wouldn’t be sat here because that experience is a big part of why Warner wanted me. So if you want to get into the music industry, whether it’s with radio or even being in a band, you have to do something before off your own back.